I had the opportunity to interview Richard Lewis, an intern who worked at a commercial real estate brokerage for several months earlier this year. A local university student majoring in Entrepreneurship and Emerging Enterprises, most of his internship involved introducing social networking to agents. Of course, I had to know how that went but I was also interested in his overall impression of the CRE industry and what he expected from brokerage. What did you think working as a CRE agent would be like and what drew you to the profession in the first place? To be brutally honest I had no interest in the real estate industry at all before this internship. I had the opportunity to go a career fair and met an agent from a commercial brokerage there. 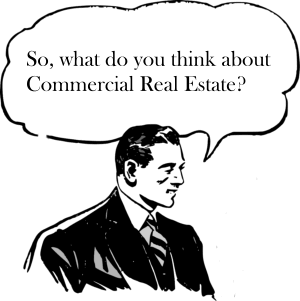 The first thing I learned was the CRE and Residential Real estate are different. But I signed up with really no idea what to expect from it. Did your experience working at a CRE firm change/reinforce your perceptions? Any surprises – pleasant or not? Let me say this. I am only be twenty years old but I have had over ten bosses in my life and worked with hundreds of employees in different fields. There has never been a company where all of their people treated me with more respect and kindness like they did. I originally thought real estate salespersons simply showed buildings, found clients, and negotiated the sale. I was pleasantly surprised to find out that each agent is really an entrepreneur. I saw so many different problem-solving methods and thinking out of the box. What technology would you expect a brokerage to provide its agents to use directly or by the support staff on their behalf? Every firm should have a social media presence, and a large one. This will make it easier for agents to gain a social media network over time. Database technologies are a must, with a close second being someone to analyze the statistics. Regarding whether a brokerage should supply agents with hardware like company phones or laptops: With the crazy world we live in I feel safe using my personal phone only so a work phone would only complicate and confuse me. What technology do you think agents should be using? I think right now, premium LinkedIn. I found a breath-taking amount of agents didn’t even have a profile picture on their LinkedIn account. I showed agents LinkedIn’s search tool and explained that with premium membership agents could find everyone in LinkedIn who could be interested in their unique property, and then send them INmail about it. I believe there is potential for Instagram to be a tool for agents if they can acquire a large enough presence. Besides technology, what else would you expect brokerages to provide its agents? All agents should have free use of paper goods, printing, color printing and office supplies. One thing I noticed during my internship however was that some things weren’t branded. I would 100% say, if you are going to give something out, PUT YOUR NAME ON IT! Some people predict all real estate transactions will be automated. What are your thoughts on that? I think automation is the light at the end of the tunnel, but, I speak for myself on this one, if I was going to shell out $200K for a building, I would want to see it, hear it, and buy it, from a person. Are you considering a career in CRE? This summer I will be licensed and in the Fall return to brokerage. I want to get a taste of real experience and will go from there, but I can’t realistically see myself as a CRE agent for the majority of my life. Chris, this made me smile. Reminded me of when I was brand new, 22, wide eyed and all that. The ‘tools’ given me at my desk were a land line phone with big square buttons you had to mash to call out or connect to a call waiting along with a message pad in case I took a call for someone else; a legal size ‘yellow’ pad and some No. 2 pencils; a phone book and a criss-cross directory; the zoning ordinance and zoning map books; a book of purchase agreement forms (one pager, mostly blank); a legal size short form 2 page lease and the long form 4 page version; some legal size manila folders and some 5×7 multi-part uniform sales agency (listing) forms that had blanks for what type of listing (open, non-exclusive, exclusive, etc), the address/legal description, the asking price and the commission rate… the rest talked about our rights to collect the commission; a book of office listings and what was in the MLS (not much), and some business cards. That was about it. The coach assigned to me for the first six months told me to read the zoning ordinance thoroughly and study the maps among my first tasks. Then he gave me some white papers on the art of cold calling to read. After that, I was pretty much on my own. Your millennial has a great early perspective and the idea that this is not what he would expect to do for a lifetime is revealing and in concert with what we keep reading about the many ‘careers’ this group will have over time. Fascinating. Good on ya! Ahh…the good old days…though they actually sound pretty bad…! Hmmm… yes, there was good and bad. Many owners would put up their own sign to market their property and many didn’t find much use for brokers. Without electronic anything, we actually had to know the market and the business and professional customers really well. Networking had what seems like real meaning then! Top brokers would form their own secret societies because most listings were exclusive right to sell and would only be ‘shared’ with those who could be trusted – and absolutely no resi brokers allowed. We would never enter a listing in the MLS! Information was totally protected and is what gave rise to a certain class of haves and have nots. Completely opposite from today’s standard and the Internet of Things… Its been a fascinating journey!